This article by ICM's Director of Education and Training David Jones builds upon his previous articles and is provided to further assist all those who really must be competent in understanding what is needed for having regard to whatever has to be designed to ensure the buildings are fire safe! David Jones is able to call upon own personal hands-on design experience when he was commissioned by Croydon LB back in 1998 to design overcladding solutions to their high rise residential tower blocks ... all of those Croydon HRRBs passed the Fire Test and assessment undertaken by the BRE post-Grenfell ~ David Jones comments "whilst I am personally proud of the achievement to have designed and specified successful design solutions I am sad angry and certainly not proud that standards and competence in parts of my construction sector has fallen to a new low!" A competent designer having proven skills, knowledge and appropriate experience would culturally know and understand the use of non-combustible materials within the external wall system can limit the spread of fire and the risk of secondary compartment fires in other parts of the building. (b) in a workmanlike manner. to which has now been added three important new paragraphs that include exemptions for certain materials such as seals and gaskets, which are set out in the new paragraph 3, below. (2) Subject to paragraph (3), building work shall be carried out so that materials which become part of an external wall, or specified attachment, of a relevant building are of European Classification A2-s1, d0 or A1, classified in accordance with BS EN 13501-1:2007+A1:2009 entitled ‘Fire classification of construction products and building elements. Classification using test data from reaction to fire tests” (ISBN 978 0 580 59861 6) published by the British Standards Institution on 30th March 2007 and amended in November 2009. David Jones points out that the only recognised classification is the European classification. The older British Standard classification, which was recognised in previous guidance, is not now included in the new regulation. David Jones also reminds that 'guidance' is not the law nor does it prescriptively guide designers to solutions that are safe in all circumstances and situations. “Relevant” buildings over 18m must be constructed or refurbished using only materials in the external wall which meet the limited combustibility requirement of A2-s1, d0 * or better which is currently referred to in terms of a 'new ban'. Relevant buildings are defined below in new paragraph (4) of the Regulation. The guidance in Approved Document B for any other building over 18m states that materials in the external wall should meet the limited combustibility requirement of A2-s3, d2 or better. 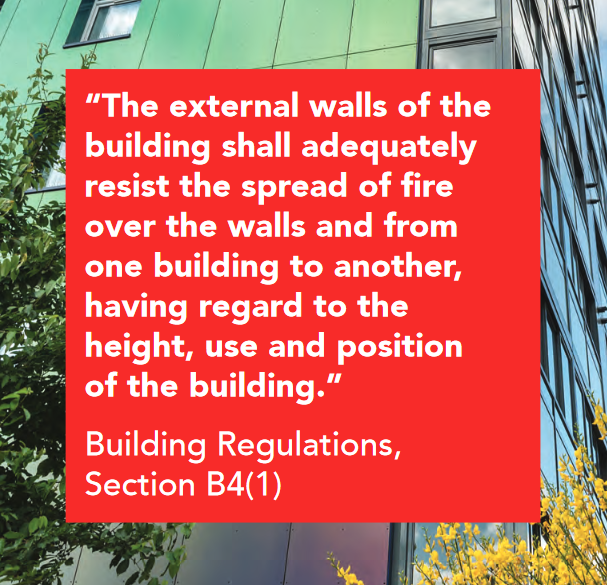 The new paragraph (3) details those components that are exempt from the ban, which applies to the entire external wall construction, and not just the cladding. (j) window frames and glass. (b) ‘above ground level’ in relation to a storey means above ground level when measured from the lowest ground level adjoining the outside of a building to the top of the floor surface of the storey. So, new regulation 7(2) applies to any building with a storey at least 18m above ground level containing one or more dwellings. By including institutions (which are defined in Regulation 2) it also covers some residential schools, care homes and hospitals, sheltered accommodation, student residences or other institutional accommodation blocks. The final group includes any building that contains ‘a room for residential purposes’. Hostels, hotels or boarding houses are excluded, unless they are converted into residential accommodation, such as student housing. David Jones takes a personal view on the current exclusion on hostels, hotel and boarding houses - "I do not apply the exclusion - by applying good sense and basics of competent risk management it is difficult, if not impossible, to differentiate between trusting residents asleep irrespective of use class!" There are additional amendments in Regulation 2, relating to the definition of an external wall and a ‘specified attachment’, in the definition of material change of use in Regulation 5 to refer to new Regulation 7(4)(a), and in Regulation 6 to mirror the new Regulation 7(2). The material change-of-use requirement is very important, because it means that – for example – a hotel may be built using materials not permitted in a student residence, but the hotel cannot then be converted to a student residence without replacing any non-compliant materials. This means that owners or developers will need to think hard about the materials used in taller buildings that are not covered by Regulation 7(4)(a)(i) or (ii). Ambiguity and conflicts in the guidance contained in ADBv2 does render it an unsound process for anyone to place absolute reliance in that published guidance for the purpose of selecting insulation for the external envelope of a building and fully supports Michael Mansfield QC in his call for an immediate moratorium limiting "nothing less than A1 until the sector designers get a competent grip and understand the problems!" and David Jones adds " ... those who select and specify insulation products to be used in the external envelope of any residential building should possess appropriate skill, knowledge and expertise to be able to make any choice other than classified 'Non-Combustible' Class A1 "